The Town of Ione’s water source wells contained significant amounts of iron and manganese that accumulated in the lesser velocity piping throughout the town. Over time, this sediment caused the steel piping to corrode and rupture. The water distribution system was replaced under separate contracts. TD&H Engineering constructed a new facility to filter iron and manganese, and remove arsenic to acceptable levels. We developed an engineering report, environmental reports, cultural resource report, biological assessments, design plans, specifications, and a construction estimate. TD&H Engineering coordinated among funding agencies: USDA, CDBG, EPA, and State Revolving Fund. All work was reviewed for compliance with Washington Department of Health and the USDA-Rural Development requirements. The treatment facility consists of a new masonry block building which houses three large dual media filters. 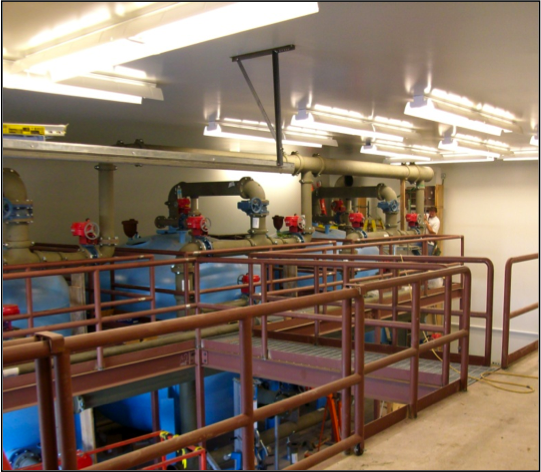 These filters are equipped with automatic backwash and forward flow cleaning, air compressors for pneumatic control valves, blowers for air sparge cleaning, and backwash storage tanks to allow metered flow into the Town’s sanitary sewer system. In addition to the new treatment facility, the project placed a new well on-line and removed old and outdated equipment in the existing well control building.